This brilliantly simple graphic by Adam Grossman neatly illustrates how the scale of human achievement is dwarfed by the size of the galaxy. 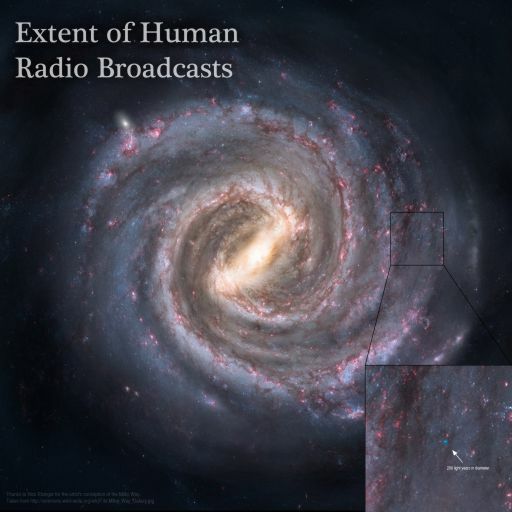 We've been emitting radio transmissions for about a century now, and since they travel at the speed of light, the very first transmissions have reached a theoretical distance of one hundred light years from the Sun. (As Emily Lakdawalla points out in the Planetary Society blogpost where I first found the graphic, the inverse square law means that those transmissions would be so incredibly attenuated as to be undetectable except by the magic of advanced alien technology.) This means that all of the transmissions to date are contained within a sphere of two hundred light years' diameter. The graphic shows just how small that is, compared to the size of the Galaxy - if you click to embiggen the image, you'll see that a little blue dot in the centre of the enlarged square: that's us, that's as far as we've reached out. Space opera's central conceit is to imagine that human influence can extent across the entire breadth of the Galaxy. Across billions of stars, and about 120,000 light years. And cosmology operas imagine that humanity can influence the billions of galaxies beyond our own, the fate of the observable universe, and even multiverses beyond that. Which is why, of course, breaking or getting around the Einsteinian lightspeed barrier is such a common trope, in space opera. While some writers - Alastair Reynolds springs to mind - have cleverly incorporated the long spans of time required to traverse interstellar distances at sublight speeds into their plots, they usually (as far as I'm aware), limit themselves to so-called near-space. Conventionally, that isn't much bigger than the volume of the little blue dot. That image really brings home why it's so necessary to break the speed limit if you're going to have any kind of comprehensible galaxy-spanning plot, and introduce human dramas to the galaxy's vast stage.